Okay, so after my last post when I ranted about how the kids were driving me nuts, I feel compelled to write how wonderful my day with them was yesterday. First of all, Jeremy had to go to work. Savannah is my early riser, so she was up with him and I heard him get the milk for her cereal. That was around 6:45. Then I went back to sleep, expecting to either be awakened by her to watch TV or by Emery around 7:30, ready to get up for the day. So imagine my surprise when the phone rang at 8:45! Yes….EIGHT FORTY FIVE!!! Oh my Heavens! Savannah had just walked into my room about a minute before that to tell me she had just written out all her birthday invitations (her birthday is not until December…hee hee). I was still looking through all the tiny pieces of paper invitations and didn’t realize it was so late until I went to answer the phone. I haven’t slept that late with my kids in the house in 4 and half years! I felt like I had slept for 2 days! It was wonderful! I just love this thoughtful side of Savannah. Not too long ago when Jeremy’s grandma was in the hospital we took the kids to see her. At first Savannah was very apprehensive about going. She didn’t like the smell in the building and Grandma ‘dessa didn’t look like herself. But after 20 minutes or so, Savannah climbed in the bed with her, took her hand and started stroking it softly. Then she asked how she was doing and got her some water to drink. I was really proud of her not just for being sweet, but because she had to overcome her fear of the hospital to be there for her Great Grandmother. And I see this behavior out of her all the time at home. It’s not uncommon for her to ask, “Can I help you with something?” And I can’t tell you how many times I’ve come into the kitchen to see a portion of her snack sitting on her brother’s high chair, ready for him when he gets up from his nap. Maybe I’m reading too much into it, but I really think she may have a heart for service. 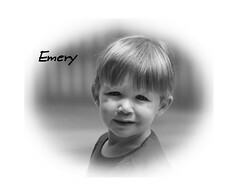 Well, that kind of got off topic from yesterday, so moving on to Emery. He is just the most wonderful child EVER to sleep until 9:15 on a Saturday! Need I say more??? What sweet children…and OMG — what GREAT pictures!!!!! Where did you get those????? Enough to melt a Nanny’s heart first thing in the morning. LOVE the photos! You have beautiful children! These are the moments we have to hold on when things get crazy! I’m so thankful I have a blog full of these like treasured times to help me remember. Cute kids! Great stories…especially about the pish! exactly what we need, when we need it! What a sweet post…Kids are a gift, there is no doubt! Love the pictures! 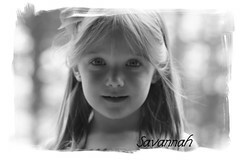 Because Savannah does look older in the picture, she looks that much more like you! Congrats on the extra sleep!